Movie Review: Apart from André Techiné’s “In the Name of My Daughter”, I’ve no memory of another recent film that had seduced me so much in the first two-thirds and then completely let me down in its conclusions. The film charmingly captivates at first, retrieving that old virtual French cinema that he created in the 90’s with “Wild Reeds”, “Thieves”, and “Alice and Martin”. Co-written by Téchiné and Cedric Anger, this is a fictional account of the true story of Agnes Le Roux, and was based on the memoir from her mother and casino’s heiress, Renée Le Roux. 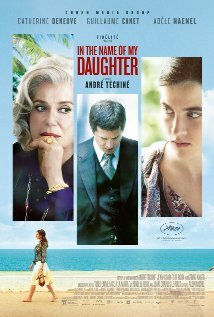 Counting on the incontestably talented trio of actors - Catherine Deneuve, Adele Haenel, and Guillaume Canet - the 72-year-old filmmaker was unable to finish strong what he had started, rushing the story into something faint, somewhat hazy, and consequently unsatisfying. The narrative begins in 1976 with the arrival of Agnes le Roux (Haenel) to France. She returns to Nice with no bags and a failed marriage, being welcomed by Maurice Agnelet (Canet), an ambitious divorced lawyer and father, who works as a business advisor for her mother, Renée (Deneuve). Struggling against financial decline, the latter soon becomes the president of the Palais de la Mediterranée, one of the fanciest casinos on the French Riviera. This is a crucial time for the scheming Maurice, who tries to persuade Renée to give him the position of assistant director. Simultaneously, he gets closer and closer to her daughter whose impatience grows broodingly due to her mother’s decision to momentarily retain her share of the inheritance left by her late father. In love, the candidly naive, Agnés, shows a dangerous availability to a man who transparently assumes other lovers and a cunning posture that only envisions wealth and power. When Renée ignores Maurice request, he unites forces with a mobster, and one of her strongest rivals, Fratoni. It doesn’t take too long for Agnés to join them in their destructive plan. Sadly, the final 30 minutes are feeble, an uncontrollable narrative calamity that blurs the, until then, absorbing portrait.